Email marketing, especially a newsletter, when done right can bring significant interest and business to any size company. However, email consistently leads the way as being the most preferable marketing method by both marketers and customers. Contrary to popular belief, customers don’t really hate email! They just hate getting too much of it. Especially when it’s irrelevant content. An average person receives 121 emails a day. The human race as a whole gets 193.3 billion emails every single day!! Out of these, the majority of email traffic comes from the business world, which accounts for over 108 billion emails sent and received in a day. Yet, email marketing has one of the greatest ROI’s – $44 for every $1 spent! compared to all the other marketing channels. Newsletters are a great way to personalize! As marketers, our job is to put out content that is relevant to the consumer and at the same time, do it in a manner that doesn’t take up too much of our time. So what can a business do to make sure they are putting out the right content that not only gets a response, but also urges the receiver to perform the intended action? Studies show that marketers who are using personalization to make their emails more relevant are getting a 2.5x higher click-through rates, and are generating 6x more sales from their campaigns. Cool right? This personalization of newsletters, however, comes at a cost. Creating personalized newsletters take up a lot of time and effort, an asset that’s hardly available to marketers. 3) Type of industry you are in and much more! One such email marketing tool that is very popular amongst businesses of all shapes and sizes is GetResponse. Using email marketing services like GetResponse can provide you the tools to make a newsletter, but it still requires a lot of time and work on your part to craft that perfect newsletter that makes your time spent ‘worth it’. As fellow marketers, we decided to do something about reducing the time spent creating email newsletters! We came up with a tool that’s already being called “every marketer’s BFF”! Elink.io is a content curation and marketing tool that helps you create newsletters in minutes. Yes, you heard that right. Minutes! Just enter the links to the content you want to share as a newsletter and elink will generate a title, an image and a short description of each link. Give your newsletter some intro text and a header and bam! elink will pop out your newsletter’s HTML code that you can copy and paste into GetResponse. The best part is, elink’s templates are modern, responsive and as a result, look great on all devices! Let’s go through the steps of creating a newsletter in 5 minutes! elink.io provides you an option of choosing any newsletter templates that have been created to be responsive, modern and interchangeable. If you realize, later you want to see how your newsletter looks in another template, come back and update anytime. Copy and paste the URL of any content on the web and elink.io will automatically display the image, a title, and a short description regarding each link. 3. Give your newsletter a title! After publishing, go to your dashboard and select the newsletter button. 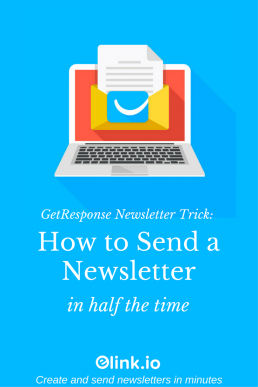 Copy the HTML code and get ready to export your newsletter to GetResponse! In your GetResponse dashboard, click on create newsletter. Choose the HTML source editor option. Paste your HTML from elink in the GetResponse editor. You can even preview your newsletter or send it as a test to yourself to make sure everything looks as intended. Add all the recipients and schedule your newsletter for takeoff! Congrats! You are now able to send an epic newsletter which looks good on all devices in a matter of minutes! Share this hidden gem with your fellow marketers and enlighten them to the power of elink.io! PS: If you don’t use GetResponse, you can still send out visually appealing newsletters using Gmail, Constant Contact, ActiveCampaign or any other marketing service in minutes with elink.io! I’m trying for a while to take my e-mail marketing strategy more seriously. This tool looks quite simple to use. It seems quite similar to MailChimp, which I’m used to manage and create newsletters. Hi, Christina! You should definitely take your email marketing strategy seriously 😉 If you are familiar with MailChimp, you can easily use elink.io to create a beautiful looking newsletter in minutes! Thanks for sharing a new method than the usual gmail newsletter. I’d definitely try these on my email marketing. Also, it’s good you included a simple tutorial on how to use it.